I've been banging on about fiscal multipliers for some time now. Given the revelation that false assumptions by the Office for Budget Responsibility in fiscal multiplication values mean that George Osborne's ideological austerity has damaged the UK economy by an estimated £76 billion more than he claimed it would, I believe it is about time I presented a simple definition of what fiscal multipliers are. The term "fiscal multiplication" sounds complicated, but in reality it is a fairly simple concept. 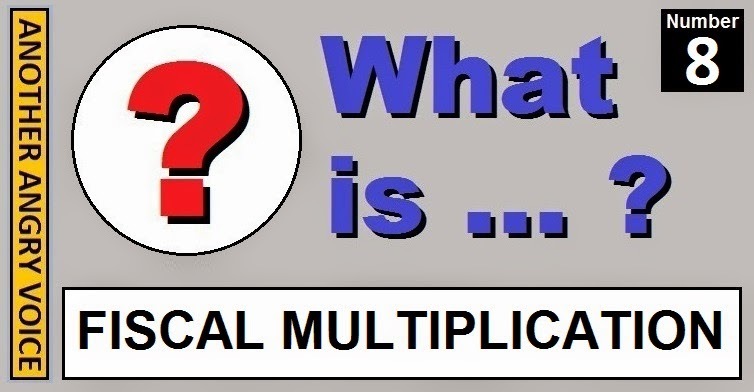 Fiscal multiplication values are used to determine the economic benefit of government spending. Calculating the fiscal multiplication value of an area of government spending is simply a method of measuring the returns on government investment. A form of government spending with a high fiscal multiplication value of 2.5, would return £2.50 to the economy for every £1 of investment, whilst a form of government spending with a low fiscal multiplication value of 0.3 would only return 30p to the economy for every £1 of investment. The use of fiscal multiplication estimates is absolutely essential for any responsible government concerned with ensuring taxpayers get good value for their money. If it can be shown that a government service creates a strong fiscal multiplication effect, the government should consider increasing their investment in that sector. On the other hand, if an area of public policy creates extremely low fiscal returns, this is where governments should make cuts or introduce reforms. It has been shown that capital spending on infrastructure improvements and the construction of social housing have particularly strong fiscal multiplication effects. In the US, infrastructure investment is estimated to have a fiscal multiplication effect of 1.59 and the UK construction sector multiplier has been estimated at 2.84. It is easy to see how some infrastructure improvements create strong fiscal multiplication values. Construction projects are often strong fiscal multipliers because they are labour intensive, meaning that much of the expenditure goes directly back into the economy through wages. Once a bridge, tunnel, bypass or rail improvement project is open, it may continue to provide significant economic benefits for decades, with little need for further investment. The same can be said of social housing; much of the initial investment returns to the economy via wages and the stimulation of economic demand for building materials. Once the unit of affordable social housing is completed, a family can escape the economic exploitation of paying someone else's buy-to-let mortgage and pay rent to the state instead (further return on investment). This fall in rent will dramatically increase their disposable income meaning that they can either stimulate the consumer economy by spending their extra cash or they can save it to perhaps start their own business and stimulate the economy through productive enterprise. It has been shown that tax cuts for the wealthy are particularly poor fiscal multipliers. The Bush tax cut (50% of the benefit of which went to the 1% of wealthiest people) had a pathetically low fiscal multiplication effect of 0.29. For every $1 in lost government revenue, the economy grew by just 29 cents. It is quite obvious why: Many of the super rich beneficiaries of these tax cuts paid tax lawyers to siphon their wealth out of the US into tax havens, invested their cash in the Chinese manufacturing sector, spent their windfall on imported luxury items (yachts from South Korea, fancy European sports cars...), made additions to their foreign property portfolios or invested their excess wealth in the untaxed, unregulated global derivatives casino. 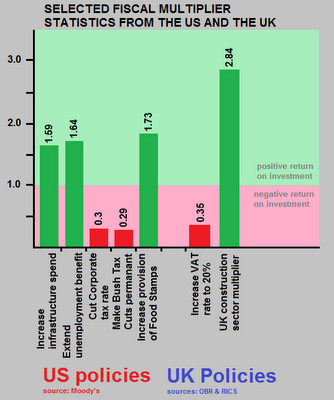 The dismal economic returns on tax cuts for the wealthy contrast sharply with the strong returns on welfare spending. Two of the strongest fiscal multiplication effects from the US have been the increase in food stamp provision (1.73) and the extension of unemployment benefit (1.64). Again, it is fairly easy to understand how such measures stimulate the economy. The poor and unemployed are extremely unlikely to spend their money on fancy Italian sports cars, evade tax by siphoning it into the British Cayman Islands, build factories in China to undercut their own national industries or invest in the global derivatives casino. Instead, they spend it in their local economy. Of all of the fiscal multiplication values I've come across, one stands out above all others; spending on flood defences. It has been estimated that for every £1 the UK government spends on building flood defences, the economy saves £8 in avoided economic damage. This means that making severe cuts in flood defence construction is an extremely short-sighted way of saving money. The Tory environment minister Caroline Spelman didn't care about that though. She slashed spending on flood defences in order to curry favour with George Osborne, then in 2012 the town of Kendal was badly flooded causing £millions worth of damage. Had Spelman not axed the Kendal flood defence scheme, all of that economic damage (not to mention social suffering) could have been avoided. After the IMF revised their use of fiscal multipliers in October 2012, the issue of fiscal multiplication should have been front-page news. Everyone in the UK should have become familiar with the concept. However the mainstream media basically ignored the story, perhaps because they thought the concept is too difficult and boring to capture public attention, or perhaps because they would rather not expose the brazen incompetence of the government and the Office for Budget Responsibility (Office for Budget Recklessness, more like it). For decades the IMF maintained that fiscal multipliers were around 0.5, which suited the hardline neoliberal agenda they were pushing, (state spending is inefficient, deregulate the economy, privatise everything, attack welfare provisions...), however in October 2012 they finally admitted that they have been grossly underestimating fiscal multipliers and that the "real values" range between 0.9 and 1.7, meaning that by their own admission, their previous estimates had between an 80% and a 320% margin of error! Unfortunately for the UK, the OBR (established by George Osborne) had been using the IMF's false fiscal multiplier values to forecast the effects of Osborne's ideological austerity experiment. Instead of undertaking real evidence based analysis on the economic returns from various and diverse forms of government spending, the OBR simply typed the IMF's absurd under-estimates into their equations, which gave them precisely the result they and Osborne wanted; that austerity would create economic growth by eliminating "wasteful and inefficient" government spending. The problem is of course, that simply using arbitrary and grotesquely underestimated fiscal multipliers obscured the fact that a lot of the eliminated government spending is actually extremely beneficial, returning much more to the economy than the initial investment cost. As the Tories slashed away at this beneficial public spending, the economy contracted, hence the litany of excuses from the OBR for the poor economic performance (the cold winter, the Japanese tsunami, the wet spring, the royal wedding, the Eurozone crisis, the Jubilee, the wet summer...). The reason the economy was contracting when their models said that it should be growing has little to do with any of those excuses and everything to do with the fact that they just bunged a load of arbitrary and inaccurate figures into their calculations to create the fiction that Osborne's fiscal austerity agenda would (or could ever) work. It has been conservatively estimated that this poor use of fical multipliers has allowed Osborne's ideological austerity experiment to cause £76 billion more in economic damage than he, or the OBR had been claiming it would. It is absolutely no wonder that the UK economy has been contracting (it is smaller now than when Osborne came to office in 2010) given the reckless incompetence of simply using arbitrary figures from the IMF to do economic forecasting at the national scale, instead of carrying out evidence based analysis. One of the main criticisms of fiscal multipliers relies on the right wing fallacy of "crowding out". This is the theory that it doesn't really matter how efficient government spending is, it "crowds out" private sector investment which otherwise would have happened. The argument against bothering to calculate the efficiency of state spending is built on the fallacious generalisation of state sector inefficiency, (the assumption that private sector is always, by definition more efficient than the state sector), which is clearly just a simplistic justification narrative aimed at promoting the favoured policies of privatisation and welfare destruction. There are a number of examples that can be used to demonstrate the inaccuracy of the crowding out theory. Social housing and health policy are the two I've selected here. After Margaret Thatcher's government came to power in the 1979, government investment in social housing was slashed, local authorities went from constructing between 100,000 to 200,000+ houses a year in the 1960s and '70s, to practically zero from the mid 1980s onwards. If "crowding out" were real, then given this huge decline in state "interference" in the housing market, one would expect to see a large increase in private sector housebuilding and an overall increase in annual new builds (since the private sector is supposedly always more efficient than the state sector). In fact, what has happened since the destruction of social housing policy, is a long stagnation in private sector housebuilding, followed by a significant post Millenium decline, and dramatic decline in the overall number of houses being built each year. In fact, since the mid-1990s the total number of annual house completions is lower than the average number of completions in the social housing sector alone during the 1960s and 1970s and this is despite a dramatic increases in demand due to the rising UK population. In healthcare it is useful to consider the difference between the largely private sector system in the United States and the universal state healthcare systems in Western Europe. If the "crowding out" effect actually existed, one would expect European healthcare to be significantly less efficient and the European health indicators (life expectancy, child mortality, preventable diseases...) to be worse. However what we find is that countries with universal state sector health provision generally have more efficient healthcare systems (in terms of GDP% expenditure) and better health outcomes (longer life expectancy, better child mortality statistics, fewer preventable deaths...) than the private sector dominated system in the United States. Another criticism of fiscal multipliers, is that the calculations don't take sufficient account of the Marginal Propensity to Consume. This sounds complicated but it isn't. Marginal Propensity to Consume (MPC) can be seen in the aforementioned disparity between the spending habits of the rich and the poor. Rich people are much more likely to save any extra income, invest it in untaxed markets or to stash it in tax havens, whilst poor people (low income workers, pensioners, students, the disabled, the unemployed...) often don't have any choice but to spend every extra Pound they receive in order to meet their immediate needs. 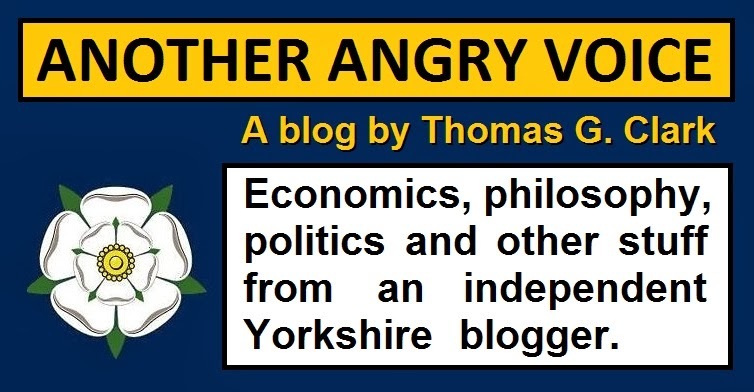 A wealthy individual that shifts all of their extra income to a tax haven would have an MPC value of 0 whilst a pensioner, student or low income worker could have a MPC value of 1.00 or even higher. This higher value is possible when the extra income is seen as regular and future guaranteed, allowing the low income worker, student or pensioner the confidence to spend more than the extra £1 in anticipation of future income. Aside from the individual, there is another tier of MPC to consider; the organisational level. I'll use an hypothetical example to illustrate this. If a scheme to provide food vouchers is initiated where the vouchers are only redeemable at one particular supermarket, one which pays poverty wages and avoids tax on their profits, the MPC value of the scheme is going to be significantly lower than had the scheme allowed recipients to use their vouchers at local businesses too. This is because local businesses are much more likely to pay out this additional voucher income in wages and less likely to siphon it straight out of the UK economy via complex tax loopholes. Once more MPC values can rise above 1.00, if the small local business owner sees these food voucher schemes as regular future guaranteed extra income, they may borrow (to fund improvements or expansions for example) against this fixed future income stream. Unlike the crowding out criticism, the MPC criticism is a methodological, rather than a conceptual criticism. It is a complaint that, although useful, fiscal multiplication statistics are far from reliable if they don't take the spending habits of recipient individuals or organisations into account. Another methodological criticism is that fiscal multipliers don't take externalities into account. Again "externalities" is a complex sounding word but in essence it is very simple. An externality is a cost or benefit that is not transmitted through prices. If fiscal multiplication is the only tool used to determine government spending priorities, there could be a number of negative consequences, from the increase in negative externalities or the decrease in positive externalities. If a government finds that investment in loans to heavy industry create good fiscal multiplication values, this kind of investment could create strong economic returns but at the cost of several negative externalities (air pollution, water pollution, land pollution, unsustainable resource depletion, climate change...). Other negative externalities include; anti-competitive practices, increased crime, nuclear pollution, decreased economic diversity, negative health outcomes, antibiotic resistance and many more. If a government finds that investment in education creates poor fiscal multiplication values and sets about slashing funding for schools and universities, the negative externality would be a gradual decline in educational standards. Although the immediate impact of these funding cuts would be small in economic terms, eventually the externality of a less educated workforce would feed through into the economy, because less educated workers are less productive workers, and the potential of high-tech industries would be severely diminished by a shortage of suitably skilled workers. Other positive externalities that could be overlooked in the search for ever higher fiscal multiplication values include social cohesion, positive health outcomes, sustainability, positive environmental consequences, social and economic freedoms and economic diversity. Fiscal multiplication values are a useful tool, if they are used as part of robust evidence based analysis methodologies for determining the value of government investment. These methodologies should also include the calculation of externalities such as pollution, resource depletion, social outcomes, etc. However, it has been demonstrated that in the wrong hands fiscal multiplication statistics can be extremely destructive. If economists see them as numbers that can just be typed into their economic models based on IMF guesstimates, the consequences can be catastrophic. If economists can't be bothered to actually carry out their own fiscal multiplication analysis on the government spending they are reviewing, it would probably be better if they simply admitted their policies were ideologically driven, rather than maintaining the fiction that they care about facts and analysis. Anyone that is vaguely familiar with science and maths knows that you will ruin the whole equation if you simply shove in a load of arbitrary guesstimated numbers because you can't be bothered to do the research to find out what the real numbers should be. I believe that the most vocal opposition to the use of fiscal multipliers as part of an evidence based methodology for determining the value of government spending, would come from ideologically driven Conservatives. This opposition arrises because fiscal analysis has repeatedly shown that several fundamental Conservative policies such as tax cuts for corporations and the super-rich and rises in regressive taxation create extremely poor fiscal returns, whilst policies that are traditionally opposed by Conservatives, such as investment in public infrastructure, social housing and welfare provision, often create extremely strong fiscal returns. If you hear anyone arguing against the proper use of fiscal multipliers or against evidence based policies in general, you should ask yourself what agenda it is that they are trying to protect. I believe that I have demonstrated that fiscal multipliers should only be used if they have been carefully calculated (rather than just pulled out of an IMF manual and arbitrarily applied) and that they should form only part of the government spending considerations, alongside analysis of wider implications such as the environmental and social consequences of changes in government spending. One other, more general conclusion is that like so many other economic words and phrases, the name is far more complex sounding that the actual idea. If Fiscal multiplication was actually called Returns on Investment, I believe a lot more people would be able to grasp the meaning instinctively, simply from the context in which they read or hear the words.